Dictionaries are one of the best writing tools a person could possibly own. Accessing definitions, correct spellings or proper word usage in a dictionary is as easy as putting on a pair of flip-flops. I tend to edit while typing at my desktop which makes the use of spell-check and online dictionaries quick and convenient. Away from my PC, I use Encarta World English Dictionary. A Smartphone would be less cumbersome than this hefty hardbound. But rural-area residences (like me) have a difficult time receiving service. Not everyone has access to the best writing tools. But you can help change this. 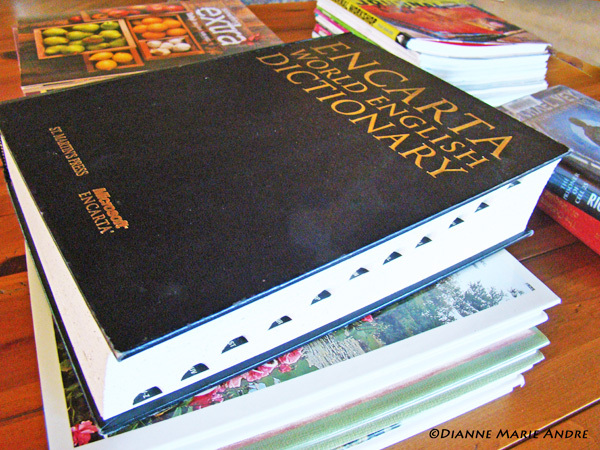 If your dictionary is collecting dust or you simply want to help students, consider donating to your local elementary school or be a sponsor at www.thedictionaryproject.org. This entry was posted in Blog and tagged dictionary, National Dictionary Day, online dictionaries, proper word usage, spell-check, sponsor, the dictionary project, writing tools. Bookmark the permalink.